Just working out colors for a couple of new paintings coming up, and doing a lot of thinking. Fall, my favorite time of year always gets me reflecting on stuff, lots of stuff, maybe too much stuff. I love your work, you are amazing! I really enjoy seeing your work and seeing a WIP is an extra treat. It's perfect! Your work is very good, congratulations. And you call this a "sketch" ... I think I have to go back to my french english dictionnary as for me this is not a sketch but already a piece of art ! Wow, what fresh, beautiful watercolors. For me this is as good as the "finished" works, maybe better!? Thank you everyone, I was hesitant to post a sketch, it just seems not as finished as I normally make it but I do like it. I may post some more sketches soon. There's something wonderful to be said for loose and washy, I love it but my soul craves realism. 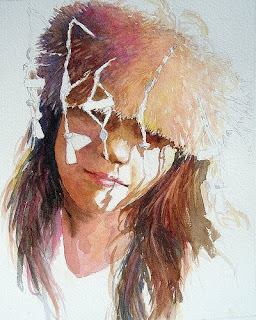 Hola Pablo felicidades por tu trabajo , me encantan tus acuarelas muy detallista y real, enhorabuena un saludo.